Women Pastors and Bible Teachers? Is it okay for women to be pastors? No, the Bible clearly FORBIDS women from being pastors. I will be using CAPS for emphasis. The epistle of 1 Timothy is given to tell us how to do things in the church. 1 Timothy 3:14-15 These things write I unto thee, hoping to come unto thee shortly: But if I tarry long, that thou mayest know HOW THOU OUGHTEST TO BEHAVE THYSELF IN the house of God, which is THE CHURCH of the living God, the pillar and ground of the truth. What does it say about women being pastors? 1 Timothy 2:11-12 Let the woman learn in silence with all subjection. But I SUFFER NOT A WOMAN TO TEACH, nor to usurp authority over the man, but to be in silence. Women are not permitted to be teachers over men, but are to remain silent when teaching is taking place. 3. One who rules HIS own house well. Since a WOMAN cannot do, or be, any of these things, WOMEN CANNOT BE PASTORS. Paul tells us the same thing in 1 Corinthians. 1 Corinthians 14:37-38 If any man think himself to be a prophet, or spiritual, let him acknowledge that THE THINGS THAT I WRITE UNTO YOU ARE THE COMMANDMENTS OF THE LORD. But if any man be ignorant, let him be ignorant. These things which Paul has written are THE COMMANDMENTS OF THE LORD and we have no right to reject or disobey them. Therefore, a “women pastor” must NOT be accepted nor embraced, but must be rebuked for her sin, and corrected from scripture (2Tim. 3:16) so that she might repent of her sin against God. 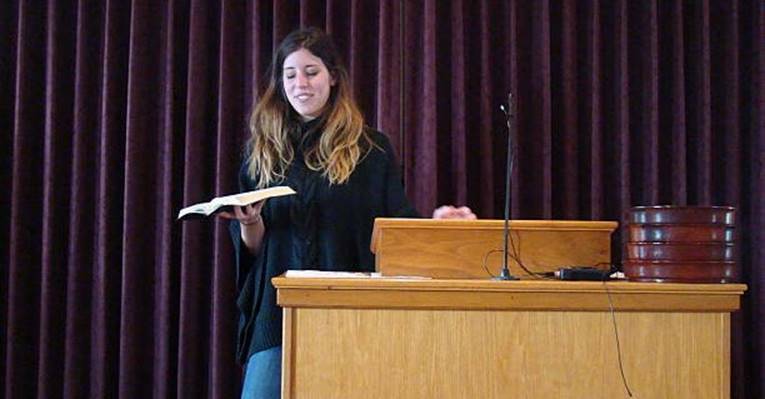 Is it okay for women to be Bible teachers? No, that is NOT Biblical either. Here is the passage people use to justify women teaching “Bible studies”. A careful examination of this passage will demonstrate that it is teaching nothing of the sort. 1. This passage is ONLY authorizing “aged women” (old women) to do something, but is being misused in our day to authorize All WOMAN to do something. Younger women are defined by the text as those who are still raising their children. Therefore, aged women must be women whose children are adults having already been raised, otherwise they would be the same as “younger women” and there would be no distinction. 2. The content which is to be taught by these aged women IS NOT THE ENTIRE BIBLE. What they are to teach is SPECIFICALLY LISTED, and only takes up two verses. So this passage can in no way be used to authorize women to teach the entire Bible. 3. This passage is speaking of aged women teaching younger women in their day to day lives, and CANNOT be twisted and misapplied to a CHURCH setting - for scripture forbids this elsewhere. The problem is that people do not rightly understand the word “church” in our day. The word church means “assembly” and speaks of the believers who assemble together to be taught the word of God. Paul uses the word “church” not only to refer to all of the believers being gathered into one place (1 Cor. 14:23), but also to refer to just some of them being gathered (1 Cor. 16:19). So when a group of believers gather together to be taught the word of GOD, they are a church (assembly of believers). Therefore, when teaching is taking place in there, women are not to be the ones speaking/teaching. For more on why our church practices are to be limited to those authorized by scripture, please read the article at the link below.